Your backyard chickens need to eat a balanced, nutrient-rich diet so they can experience optimal growth, weight gain, egg production and immunity from various poultry diseases. In the old days, people had to formulate their own poultry feed by mixing various grains, such as corn and wheat. Today, it’s thankfully much easier; most feed stores offer pre-formulated chicken feed rations that give your backyard birds the the exact balance of protein, minerals, vitamins and other nutrients. Educate yourself on the specific nutritional needs of your chickens so you can pick out the best stuff while shopping for feed. In this online guide, you’ll learn exactly what your hungry hens are craving! Just like you needed different food when you were a baby, a chicken has different nutrient needs at the different stages of her life. Nutritional needs also vary depending on the purpose of the chicken (i.e., layer hens need different chicken feed from meat birds). If you’re raising meat birds: Provide broiler starter with a protein level of 20 to 24 percent from the point of hatching to six weeks of age. After that, switch your meat chickens to broiler finisher (16 to 20 percent protein) until the birds are sent to be slaughtered. The amount of food your chicken eats will go up or down depending on your chicken’s age and your method of feeding him. Some backyard chicken hobbyists leave the chicken feed out all day in a sort of buffet-style setup so that their hens can eat whenever they whimsy strikes. Other hobbyists dole out the feed in measured proportions two or three times daily. For feeding meat chickens, the university notes that 10 chickens will eat 30 to 50 lbs. of broiler starter until six weeks of age, and 16 to 20 lbs. of broiler finish until slaughter. You don’t have to prep your chickens’ food in a certified kitchen, but the area in which you’re feeding your chickens must be kept clean. This reduces the risks of disease and rodent outbreaks among your flock. 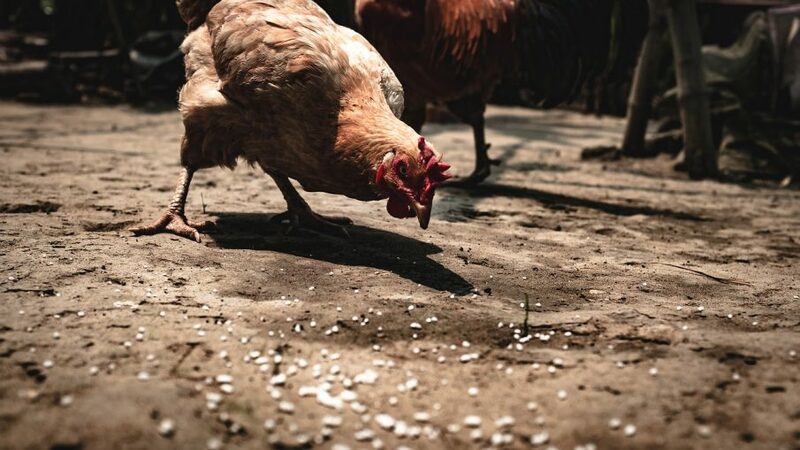 It’s far cheaper to take proactive cleaning measures than it is to try to eradicate a disease outbreak or the pests that are often attracted to dirty feed conditions (Chickens aren’t the only ones who find their feed tasty; rats and mice do, too!). Clean your chickens’ watering troughs every day and replace the water with fresh water. Also, clean out the feed troughs and remove old feed, dirt and other contaminants every other day. If possible, remove the feeders from the coop, wash them and allow them to dry thoroughly before placing them back in your coop. poultryOne.com is the ultimate guide to raising backyard chickens. i have found this material, Highly educative and informative. this answered my questions specifically, in a concise precise manner. I appreciate it. thank you. Thanks for this article. i cannot thank you enough. I have read this article. I can never thank you enough for it. However, there is something, I will want you to help me clarify. In the section of the article dealing with “Feeding Amounts”. the last sentence says. ‘For feeding meat chickens, the university notes that 10 chickens will eat 30 to 50ibs. of Broiler starters until six weeks of age. and 16 to 20ibs. of broilers finish until slaughter’. Please I am not clear about the last part of that information. Is it 16 to 20ibs per 10 chickens in one week or one day or is it 16 to 20ibs per 10 chickens until they are slaughtered in their 20th week of age? Please clarify. I will be delighted if you can find time to respond promptly as I am about to take a decision about investment in poultry and I want to be properly guided. Thanks. Are the feeding portions per day, week or month. Thanks a million,you have made it easier for me to do better next time. Can coconut meal be a protein substitute for soybean meal and meat meal in the food mix? VERY interesting information I have been looking for months. With this infor I shall be able to budget correctly for the feeds of my chicks untill they reach the point of lay. Once again I’m very gratefull to thi site. I was just wondering what quantities to feed my hens. Now I’m better informed. Thanx a billion! The article is informative as it is practical. Kindly give me the breakdown of feeding layers and broilers about one hundred each form day old to laying and the broilers up to 12 weeks. what about a 6 week old rooster. You wouldnt feed it layer rations right?. What about scratch, black sunflower, grit, grass? Or just pullet grower? Your page is highly educative and informative. I am keenly interested in poultry farming for eggs and meat production. Kindly direct me on how to get your books on poultry. I reside in Nigeria. Thanks. I was just wandering if it is possible to introduce a new young chicken into a chicken coop that already has one older chicken in it, or will the older chicken just want to attack a newcomer. Thank you for your time. This article is highly educative and will assit me in starting poultry farming and make it a success. Thank you. If there is any need about feed machinery, welcome to inquiry and email me. Love it and what we do is feed our chickens salad and tomato’s is that good? Thanks for discussing what type of feed should be given to a chicken of certain age and nutrition required for fast growth. Your article was helpful. Ty for the good information,now I feel more confident! What is the formula for mixing poultry birds layers. Sir, the guide to feeding is very helpful however I am interested to how many times during the day should we feed the layers, the amount of feed per 100 layers and what time of the day is the best time to feed the birds? thanks for the article. What I don’t understand which I beg for your clarifications in the starter part of it.When I try calculating 2.9lbs to kgs then I get 1.3144kgs is this to be given per day or for the whole six weeks as starter? Was told not to feed corn or it would stop hens form laying. use my hens for eggs and meat. Please clarify as to corn vs laying. Thanks for a very good article. At what stage will I feed my children (broiler) with Finisher feeds. Also, how long will it take for chicken feeds to expire ? I’ve finisher feeds and my birds will be 7 week next Monday 24th October. This site is good, it has educative content.Am lucky may Lord Jesus bless you guys? Where can i buy this copy bcs hv a small farm ?